Despite recent technological advances, the costs for migrants to send money across borders to their families remain extremely expensive, with fees often surpassing 5%. This column explores the various factors shaping remittance prices and identifies two key avenues for cost reduction: consumer education and competition. In particular, expanding mobile technology is helping to displace banks and squeeze remittance costs. When migrants send money across borders to their families, it promotes economic activity and supports incomes in some of the poorest countries of the world. Annual cross-border remittances are running about $600 billion, three quarters of which flow to low- and middle-income countries. To put that number into perspective, total development assistance worldwide is $150 billion.2 Indeed, for many countries, these transfers account for a significant fraction of people’s incomes. For example, in Guatemala, the Philippines, and Senegal, remittances exceed 10% of GDP. Yet, despite the remarkable technological advances of recent decades, remittances remain extremely expensive. The virtues of domestic payments systems like Zelle, an inexpensive, bank-run means for person-to-person transfers up to several thousand dollars, are very clear (Cecchetti and Schoenholtz 2017b). The marginal cost of using Zelle is zero – that is, for customers of the bank, there is no charge. Cross-border remittances are far from costless. On average, the charge for sending $200 – the benchmark used by authorities to evaluate cost – is $14. That is, the combination of fees (including charges from both the sender and recipient intermediaries) and the exchange rate margin typically eats up fully 7% of the amount sent. It is less expensive to send larger amounts, with the global average cost of sending $500 at just under 5% (World Bank 2017b). Even so, the aggregate cost of sending remittances in 2017 was about $30 billion, roughly equivalent to the total non-military foreign aid budget of the US! In this column, we discuss remittances, why their costs remain high, and what might be done to lower them. We start with a quick look at some data. Figure 1 below shows that the inflation-adjusted volume of remittances exploded over the past two decades. Today, these flows are triple what they were in 2000 and five times what they were in 1990. Furthermore, the economic importance of inward remittances has increased for low- and middle-income countries, rising from an average of 1.2% of GDP in 1990 to 1.6% of GDP today. Note: Inflation-adjusted sum of country-specific remittance flows. Source: World Bank. You might think that this massive increase in volume either reflects, or promotes, cost-reducing advances in remittance technology. But, as the next figure shows, costs have trended lower only gradually, and with considerable differences across types of transfer agents and across sender countries. 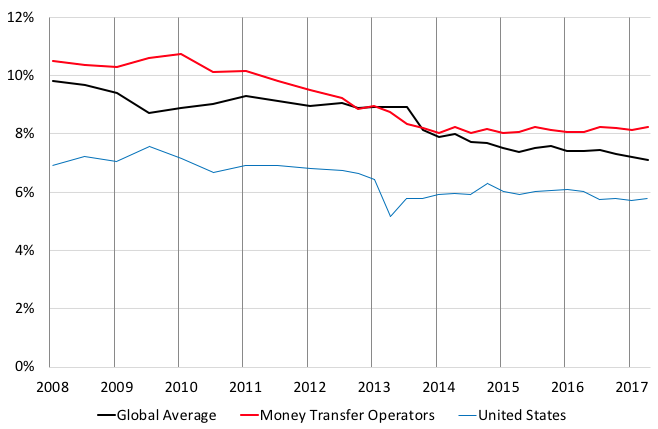 The red line is the simple, unweighted average for all providers – banks, money transfer operators (MTOs, including fintech companies) and post offices – of sending $200 from the full World Bank sample of 48 sending countries. Over the past decade, this global average has fallen from 9.8% to 7.1%. 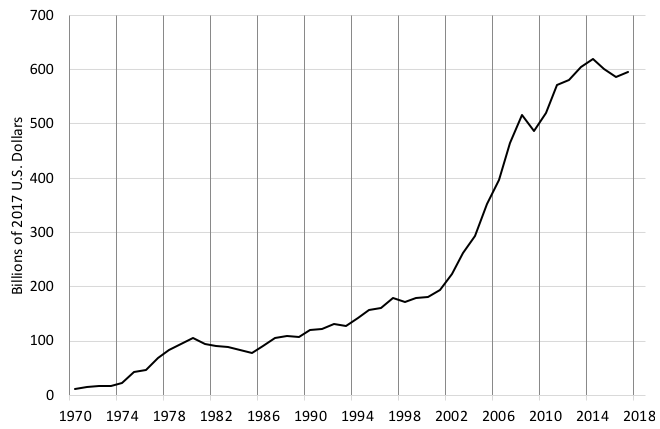 However, in the case of MTOs (the dashed, black line), like Western Union, the cost has stagnated in recent years. After falling by 2.5 percentage points before 2014, the average charge remains around 8%. And, in the US (the blue line), the cost has declined only very modestly, falling from just over 7% in 2009 to roughly 6%, where it has stayed for three years. Note: The red and black lines show the evolution of the average cost of sending funds from any one of 48 sending countries to any of 105 receiving countries in the sample. The data include a total of 365 pairs (or corridors). The blue line shows the cost of sending from the US. Source: World Bank. Drilling down to the corridor level (that is, to specific country pairs), remittance costs vary considerably, but still strike us as high in most instances. Take the benchmark case of sending $200 or the equivalent. The average cost of a transfer from the US to Mexico is $8.91; from Germany to Turkey, it is $12.83; and from South Africa to Botswana, the average is a whopping $36.60. As mentioned, the aggregate global cost of these transfers is now roughly $30 billion per year. While the direct cost is borne by the migrant senders and their family recipients, there is a sense in which the burden also falls on poor countries as a whole. The reason is that remittances enhance growth in poor countries by providing alternative means for financing investment where transactions costs are high (Giuliano and Ruiz-Arranz 2009). That is, we can think of policies that make remittances easier and cheaper as a means of boosting capital formation and productivity in receiving countries. Against this background, in July 2009 the leaders of the largest advanced economies (G8) pledged to reduce the cost of remittances to 5% – a commitment endorsed by the G20 in 2011 and again in 2014, and included in the UN’s Sustainable Development Goals in 2015 (G8 2009, G20 2011, United Nations 2015). After eight years, the global average is roughly half-way there. What can be done to lower remittance costs further? Turning to competition, Beck and Martínez Pería (2009) conclude that corridors with more migrants and more competition exhibit lower costs. Importantly, over one-half of all remittances are paid to persons in just ten countries (see below). However, where banks’ share in the business is high, costs are high as well. In fact, in the December 2017 issue of Remittance Prices Worldwide, the World Bank reports that remittance costs vary substantially by the instrument used, with transfers using cash and bank accounts costing 7%, much more than the 4.2% average cost of using mobile money (World bank 2017a). It appears that expanding mobile technology (and displacing banks) will help squeeze remittance costs. But, as Guillermo Ortiz suggests in the quote at the top of this column, a key challenge looms. Most forms of cross-border funds transfer require the cooperation of a bank at some point in the process. An MTO, for example, needs accounts at banks on both ends of the transfer corridor. However, in response to stronger anti-money-laundering standards, banks have been terminating or restricting their relationships with MTOs (KNOMAD 2017). From the perspective of a bank, mobile payments create similar risks. As is the case for virtual currencies like Bitcoin, mobile payments systems can be used to conceal nefarious activities (Cecchetti and Schoenholtz 2017a). Meeting the ‘know your customer’ standards that banks demand (and governments expect) is expensive. As a result, these factors may continue to throttle the speed with which cost-competitive technology firms make inroads into the remittance business. 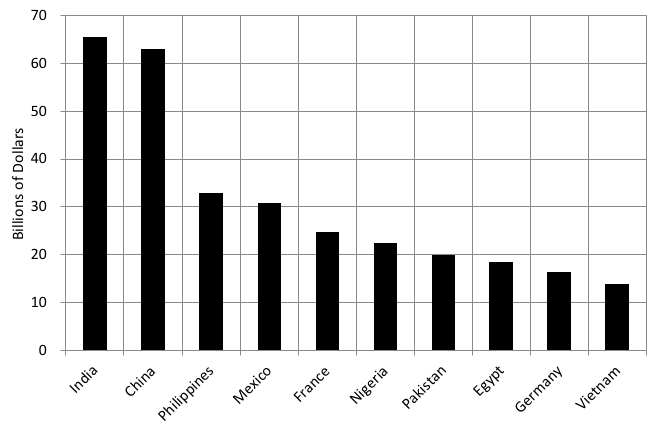 Beck, T and M Soledad Martinez Peria (2009), “What explains the cost of remittances? An examination across 119 country corridors”, World Bank, Policy Research Working Paper Series 5072. Cecchetti, S G and K L Schoenholtz (2015), “Interview with Guillermo Ortiz”, moneyandbanking.com, 19 March. Cecchetti, S G and K L Schoenholtz (2017a), “What Bitcoin has become”, moneyandbanking.com, 23 January. Cecchetti, S G and K L Schoenholtz (2017b), “Modernizing the US payments system: Faster, cheaper, and more secure”, moneyandbanking.com, 31 July. Cecchetti, S G and K L Schoenholtz (2017c), “Managing risk and complexity: Legal Entity Identifier”, moneyandbanking.com, 30 October. G8 (2009), “Responsible leadership for a sustainable future”, L’Aquila Summit, 8 July. G20 (2011), “Building our common future: Renewed collective action for the benefit of all”, Cannes Summit Final Declaration, 4 November. Giuliano, P and M Ruiz-Arranz (2009), “Remittances, financial development and growth”, Journal of Development Economics 90(1): 144–152. KNOMAD (2017), “Migration and remittances: Recent developments and outlook”, World Bank Group, Migration and Development Brief 28. United Nations (2015), “Transforming our world: the 2030 Agenda for Sustainable Development”, 21 October. World Bank (2017a), “Remittance Prices Worldwide”, Issue 24, December. World Bank (2017b), “Remittance Prices Worldwide”, Annex to Issue 24, December. See Cecchetti and Schoenholtz (2015). See information on the Western Union general website, www.westernunion.com, and in their annual report. You can find and compare prices for all 350 corridors on the World Bank’s website. In 2011, the World Bank started an education program called Greenback 2.0 aimed at increasing the efficiency of the market for remittances. See Cecchetti and Schoenholtz (2017c) for a discussion of the legal entity identifier.